Tanning, the ultimate way to make give your skin that beautiful glow but it comes with a heavy price. Tanning may be fun and relaxing, but it can play a huge factor in aging your skin dramatically and ruin the texture! I’m a city girl that longs to escape the cement building I’m surrounded by on a daily basis. I crave for some surf, sand, and sun. I love the smell of the salty-sweet air filling my lungs, or how my lips taste after I take a dip in the water. The first time I got a tan, I was in Bora Bora and I was hooked! I fell in love with the glow that lasted sadly for a short time. I got the same tan on my recent trip to the Bahamas and that too didn’t last for long. I love how my skin looks after I get a tan but recently I have become acutely aware of the effects of sun damage. With the summer days being long gone and I have no idea when I will be going on my next beach vacation, I recently started to explore the world of self-tan. Here are a few of my favorite products I have been using to help me get and maintain that summer glow without any harmful effects on my skin. 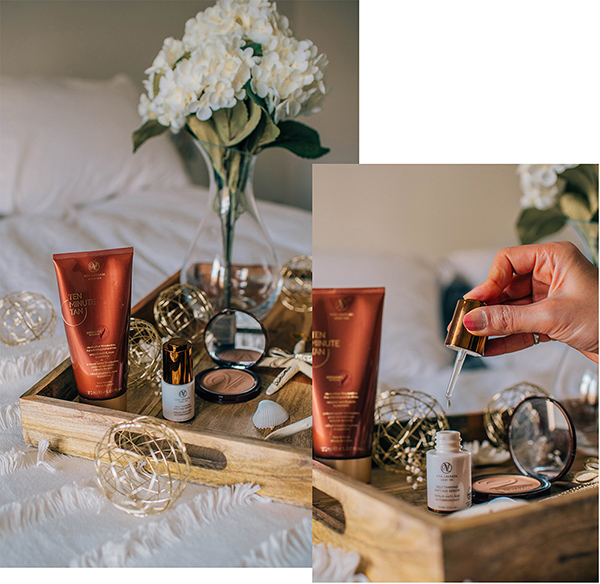 I tried Vita Liberata Ten Minute Tan because let’s face it, I don’t want to spend a great deal of time trying to get that tan and glow. 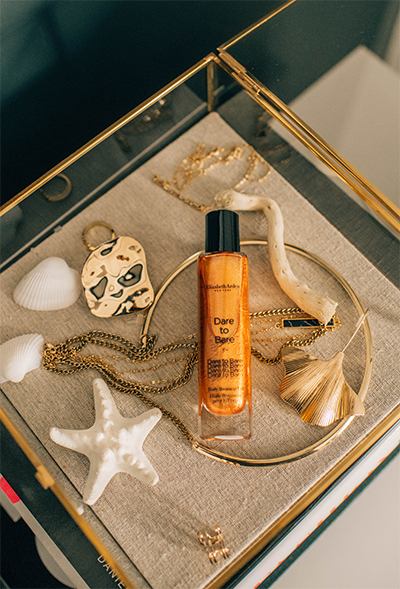 Since this was the very first self-tan product I was using, I didn’t want to mess it up and get an uneven tan. I jumped in the shower and exfoliated my skin to ensure maximum and even absorption. I grabbed the Ten Minute Tan and applied all over my legs and arms, and sat reading Reddit for 10 minutes on my phone before I could rinse it off. My skin had a bit of a glow and the tan gradually developed within a few hours. For the first self-tanning product I have ever tried, this was pretty easy to use and I love that I can control how deep of a tan I want on my skin. The next day I applied on the same product but left it on for 20 minutes to get an even warmer glow. To help complement the tan on my body, I used the Self Tanning Anti-Age Serum on my face and neck. I mixed in 2-3 drops of the serum to my daily moisturizer and applied it on my skin once. I made sure I didn’t wear any makeup that day and noticed that my skin got one shade darker within a few hours. For a noob in self-tan – these two were a huge win in my book! St. Tropez is the most popular self-tan brand I know off. I have a large number of my friends that love St. Tropez. 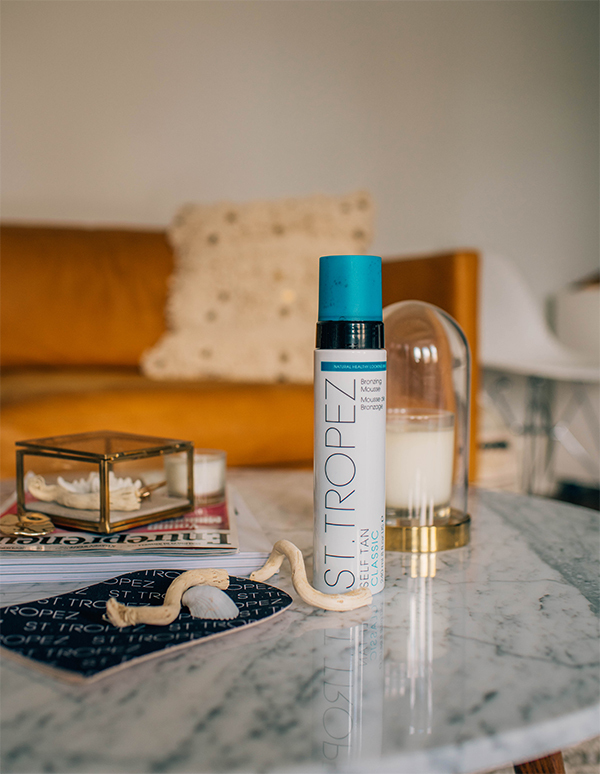 So when I got my hands on the St. Tropez Bronzing Mousse, I was excited to see the results. After being spoiled by Vita Liberata, I was actually disappointed that this was not a product I could apply on and rinse it off in the shower after a few minutes. You have to shower and exfoliate your skin, then apply moisturizer to all the dry areas before you apply the bronzing mousse. The product spits out a dark brown color mousse that smells ah-mazing! Like literally you don’t need to waste your expensive designer moisturizers because this mousse smells even better! It smells like the beach mixed with pina colada but in a very exotic and good way. You definitely need a mitt to apply on the product and make sure you brush it in a circular motion to ensure maximum and even absorption. I sat for about 5 minutes watching YouTube videos while waiting for the product to dry before I could get dressed. I have to say I love this product but I highly advise you to keep your skin away from anything that’s white or light in color until after you shower. You will see a few flakes or light beige streaks on light color fabrics if your skin rubs against it (so take that shower before you head for bed in those crisp white sheets). 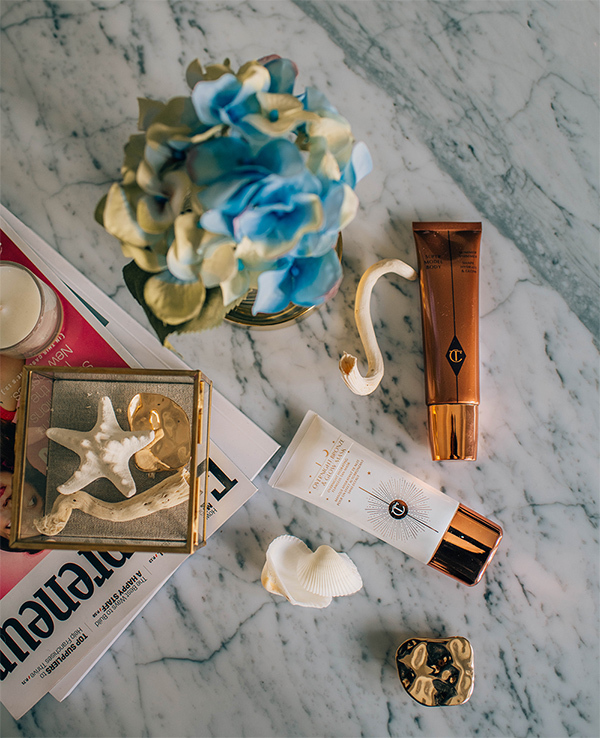 From Charlotte Tilbury, I cannot stop raving about their Overnight Bronze & Glow Mask. This product is specifically designed for your face. It’s extremely gentle and I love the fact that when you wake up in the morning, you have a bit of a glow on your skin. For the last week on my Instagram stories, I have felt extremely confident showing you my face when I wake up from bed because of this bronzing glow mask. My skin almost looks like I applied a mix of moisturizer with a small amount of foundation to create that even skin tone with a bit of a dewy look. I had to apply this product on for two nights to get that perfect bronze glow that I needed to mimic from my trip to the Bahamas. Which products are you going to try? Do you have any recommendations on what’s your favorite self-tanning product? They all sound amazing, especially the Charlotte Tilbury. Thanks for sharing these products dear. Will check these out.